Lake Michigan is one of the five major North American Great Lakes, which form the largest group of freshwater lakes in the world. There is a huge importance and irreplaceable benefits that these waters have in the biological and ecological balance of our planet. Popular with heir unique Beauty and natural diversity, the five lakes, which are often called inland seas (because the opposite beach is not visible because of the large pools and because of the curvature of the globe) are located along the border between Canada and the United States. The five freshwater lakes are Lake Superior, Lake Michigan, lake Huron, Lake Erie and Lake Ontario. Lake Michigan is the second in volume after Superior, which is the deepest. It is larger than the area of the Czech Republic for example. Lake Erie is the shallowest and smallest in volume, and Ontario occupies a smaller area, while it is located at a lower altitude than the other four pools. Huron is more shallow than Lake Michigan, But ranks second in size. Lake Superior is bordered to the south by the states of Wisconsin and Michigan, USA. Huron is the main link between all five Great Lakes. It gathers inflows from Michigan and Lake Superior. The only one, which is located wholly within the U.S. is Lake Michigan. It borders four states - Indiana, Illinois, Wisconsin and Michigan, In fact the lake is named after the eponymous state. The etymology of the name Michigan comes from the Indian name that was given centuries ago - mouse-lines (mishi-gami), which literally sounds like "Big water". To the north lake Michigan connects with Lake Huron through the Straits of Makino. Lake Michigan covers an area of 57, 800 sq. km., it is located at an altitude of 176 meters. The total length of coastline of Lake Michigan is 2646 km. This American lake at its deepest point reaches about 281 meters, width is about 190 km. Lake Michigan constitutes the eastern border of the city of Chicago. The shores of the huge pool that the residents of the city know as "sea" touch the heart of Chicago - Downtown, which is divided into two parts. Southern side is a financial center and the northern side was built up mainly with homes, shops and restaurants. In all seasons the river side of Michigan along Chicago bustles with life, especially during summer months. Then it is crowded with small boats and private yachts. 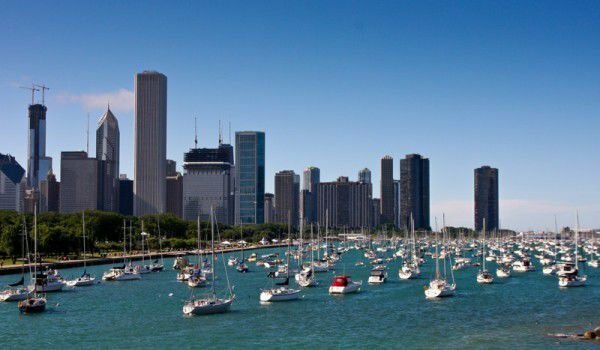 Along Lake Michigan are some of the biggest parks in Chicago, such as Grant Park, which hosts many musical and theatrical festivals throughout the year. Apart from that park, the beautiful coastline of Michigan is the only place where you can find the famous stone Petoski an is a favorite of many Chicago residents for walks and weekend recreation. In this part of Downtown is also located Michigan Avenue, where there are concentrated shops and boutiques of world famous designer brands. On the coast of Lake Michigan is found another interesting attraction - a huge Ferris wheel that is at night illuminated by thousands of beautifully colored electric lights. The wheel reaches 40 meters in height, and each of its 40 cabins have magnificent views of Chicago and Lake Michigan.